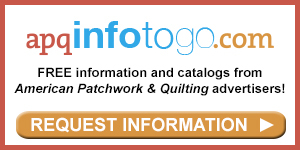 See the featured projects and web-exclusive patterns from the Quilts and More Winter 2014 issue. 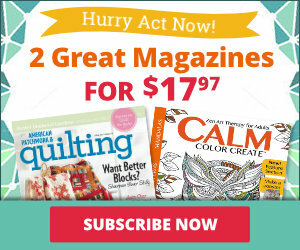 The Winter 2014 issue of Quilts and More is on sale from November 4--February 3. 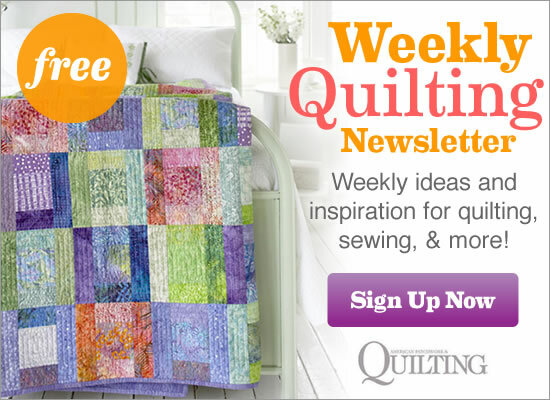 Looking for a quick-to-make quilt? Strip cutting and chain piecing makes assembling these blocks a breeze. It’s chef’s choice. Pick your favorite fat quarters and mix and match their positions on this adorable apron. Chill out and hand-embroider snowman blocks to welcome winter. 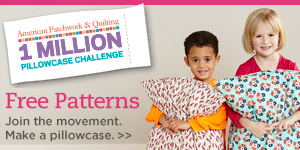 Careful placement of fabrics makes each plus sign appear to float on a solid background. Cover a plastic tape measure with scraps of fabric, rickrack, and floss for a fun and useful gift rolled into one. Keep your fingers from freezing and your neck cozy this winter with plush fabric mittens and a complementary scarf. Brighten a room with the help of primary colors and lots of sparkling white. Bands of bold color make a dramatic statement in this throw. A bit of piecing, easy fusible appliqué, and a few specialty embellishments create an inviting quilt. Take aim at trying a new skill—foundation piecing—and learn to think about sewing in a different way. 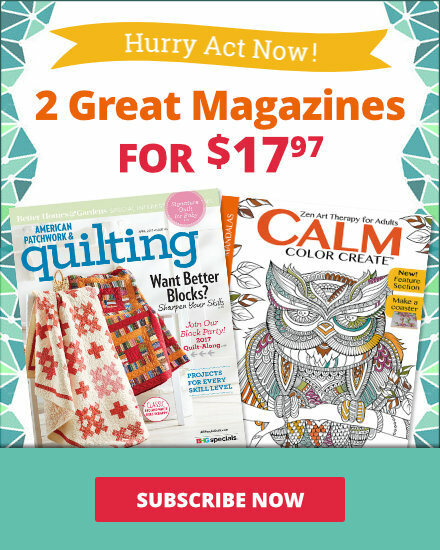 Use a rotary cutter with a curved blade to fussy-cut fabrics. Then add bits of baker’s twine, tape, and fusible web to embellish any gift wrap. It’ll be so cute—the package might go unopened! Double duty—make the cozy reversible! Use two different seasonal prints and turn the cozy inside out once the season changes. The secret to making this chevron-style throw is a single unit—the triangle-square. Store notions and gadgets in a quick-to-stitch sewing station caddy. Gentle curves provide a zigzag look with a softer side. Big pieces allow large–scale prints to shine. Red, white, and blue fabrics form a dramatic throw that looks as though it’s blowing in the breeze. Hand-stitch holiday motifs to a mitten shape for a stocking to hide presents or a cute gift for friends!